Will wishes come true this holiday season? Find out in the sparkling festive novel from No.1 bestselling author Deirdre Purcell... 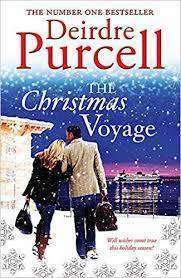 It is almost Christmas on the Santa Clara cruise liner, and as the ship sets sail from Barcelona for the last time, dramas big and small are to unfold. On board is Kitty Golden, beautiful ex-model and wife of New York financier Saul Abelson, some 25 years her senior. They look the picture of cool contentment, but looks can be deceiving. Dubliner Mary Dunne is on board with no less than eight members of her boisterous Irish family, intent on celebration. For Mary, though, a long-hidden past brings its own twist... And wide-eyed young novelist Roxy Smith is intent on observing all in a bid to find story for that difficult second novel - until she too gets caught up in the action. With handsome Captain Leifsson in firm command of the ship, if not his heart, who knows what the journey's end will bring. The Christmas Voyage is a seasonal story of high drama, romance and extraordinary outcomes.